PositronChicago.com: Quick Thoughts on "Illyria: A Shakespearean Fantasy"
Quick Thoughts on "Illyria: A Shakespearean Fantasy"
Just got back from the first night of Illyria: A Shakespearean Fantasy, produced by EDGE theatre. This was so much fun! I fear I can't put together a particularly coherent review at this hour, but it's such a limited run that I wanted to get down some impressions and encourage you to check it out. Structured primarily around Twelfth Night (shipwrecked separated twins, cross-dressing shenanigans), Illyria also draws on A Midsummer Night's Dream (rom-com escapades in fairy-controlled woods) and The Tempest (magic & supernatural beings). 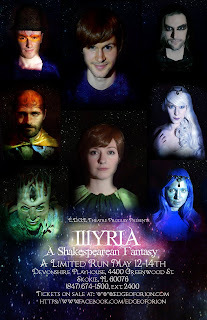 Illyria plays up the fantastic elements to good effect and, perhaps more impressively, strips downs and blends some fairly tangled plots—the resulting script is lively and more consistently humorous than many straight adaptations of Shakespearean comedies I have seen, while maintaining the kind of multi-thread madcap quality that makes his comedies so enduring. Excellent performance from the entire cast, absolutely no weak points. Highlights for me included the quintet of Malvolio, Meranda, Mandrew, Toby, and Amaltheia (Bullaro/Ray/Kemper/Miller/MacDougald)—the "fools' story" is delivered so energetically and effectively here that it ceases to be a B plot. I was also quite impressed with Aiyanna Wade's portrayal of Viola: there's a kind of perpetually-unexpected modernity to some of Shakespeare's characters that she captured perfectly, in her honesty & exasperation, and I particularly liked how well the nonverbal interactions between Viola and Orsino (Reynolds) and Olivia (Arnold) cemented those scenes. The entire ensemble seemed to click very well: blocking felt organic, and everyone on stage seemed keyed in to each other appropriately. There were some minor tech issues (music volume occasionally drowning out actors, for instance), but the minimal set worked well here. The costumes, on the other hand, were truly wonderful, conveying a clear difference between the whimsical fey court and the two mortals. Valentine (Goodman) benefited from the most striking costume—an ent-like (or Groot-like) tree-being moving ponderously on prosthetically-lengthened legs, a physical dynamic that played well against Curio (Hayden), here infused with a Puckish/Arielish manic energy. A really fun production, and honestly the thing I want to gush most about is Mary-Kate Arnold's adaptation. It's a freaking brilliant accomplishment: looking at themes and plot elements that overlap, merging here, borrowing there, making Illyria into its own thing without giving up an ounce of the language. Mapping Oberon onto Orsino and then infusing a bit of Prospero, for instance: just brilliant. Putting together three scripts (and unless my ear completely deceived me, tossing off a few references to others, as well), trimming the overall play time down, maintaining multi-level plots, while also foregrounding fantastic/fairy elements in ways the originals never do—it's extremely impressive, and I hope I get a chance to see or read this again. Coherency...failing. Go check this out if you can—it's only playing this weekend, at the Devonshire Playhouse in Skokie.